Our company is one of the best when it comes to offering you the perfect limousine packages to help you in your transport during your big day. With our beautifully decorated wedding cars, you would surely have a blast in between your destinations. We at Limo Hire Melbourne can give you a wide array of stretch limousines, which could accommodate you, your partner and the rest of your entourage in style. We have 12 seaters in the form of black Chrysler 300C units which can be accompanied by a matching sedan for the groom and the rest of the guests, and Ford G6E units which can come in either black or white. 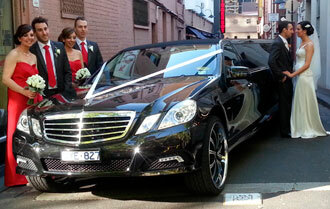 These cars are improved with a bridal door that can help the bride in coming and going out of the limo easily. This also allows for memorable photo ops to occur inside the car. The wonderful exterior of the stretch limousines are adorned with a luxurious interior that also defines roominess and comfort very well. You and the rest of the group can have fun in between your wedding venues with the car's built-in entertainment systems such as DVD screens, iPod connectivity, mood lighting and an interior wet bar where you could access a cold flute of champagne. Our dedicated and professional drivers are very accommodating to changes in the itinerary and can double as servers who could attend to your guests' requests. Moreover, they are definitely dressed for the part with the sharpest black suits. We make sure that our cars are perfect for the day by beautifying them using the most elegant decorations. We see to it that the color and details of the car decoration matches your motif.